Cape Cross Seal Reserve can be found on the west coast of Namibia and is the largest Fur Seal colony in the world with a population of around 250,000 seals. 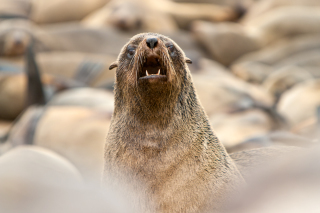 Fur Seals are categorised by the presence of ears which other species lack. On visiting the reserve one of the first things you will notice is the distinctive and pungent smell as well as the cacophony of noise emanating from these creatures. The seals tend to ignore visitors but this individual seemed to take a particular interest in me.